Just back from a few days in Scotland (beautiful as always). 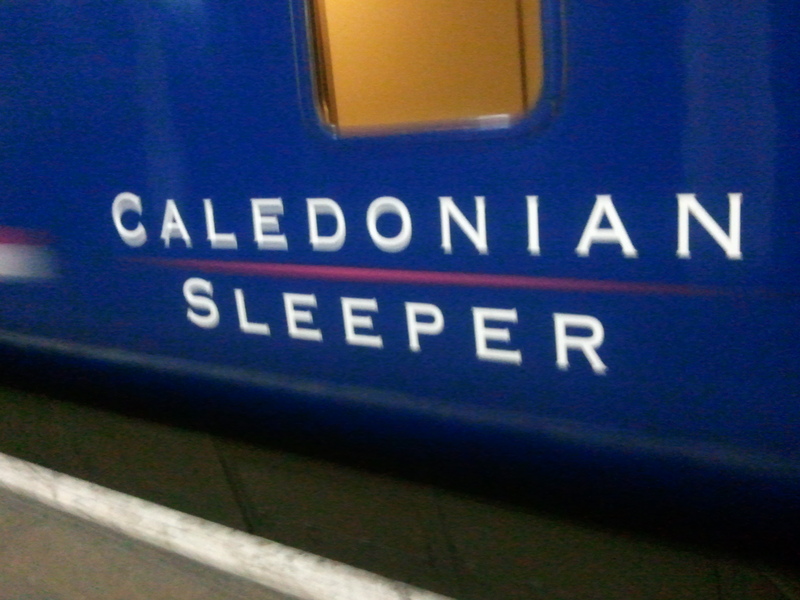 We took the Megabus sleeper bus up to Glasgow and the Caledonian Sleeper train back home, but I couldn’t find many reviews of the bus before we left. So this might be useful if you’re looking to travel up to Scotland on a budget and don’t want to fly. 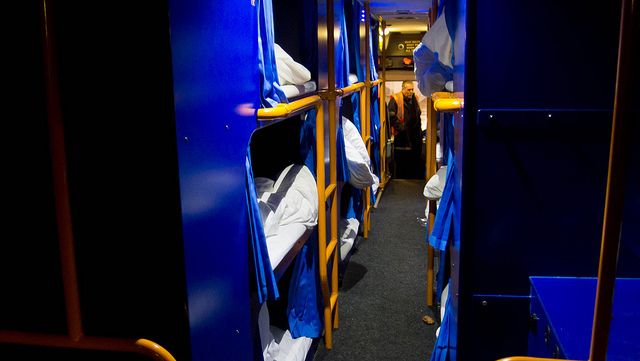 First things first: the Megabus sleeper is a glorified bendy bus with capsule type bunk beds. You can’t really sit up in ‘bed’ and if you are on the bottom bunk of three, you basically have to lie flat on the floor and shuffle in sideways. Good: free tea, coffee and fizzy drinks. Also a free croissant in the morning. Phone charger sockets in all bunks, which is handy. Bad: not good for anyone who’s claustrophobic! Set your phone alarm as the bus crew will wake you up about 15 mins before arrival. How did I sleep? Surprisingly, really well! Price: Bargain Berths are £19, £29 and £39 – book online three months in advance for the cheapest ticket. Otherwise you are looking at more like £100 one way. Leaves from: Glasgow Central at 11.45pm. You can get on board from about 10pm. Arrives at: London Euston station around 6.45am. Good: fairly spacious for a sleeper cabin (but it’s all relative). Hidden sink and space for a small bag. Free hand towel and soap provided. Free cup of tea/coffee and the world’s smallest piece of shortbread for breakfast. You can also get a free mini toiletries kit if you ask, but..
Bad: the train stewards aren’t the most friendly bunch in the world. How did I sleep? Ok, but not as well as on the bus. Still a good deal for £19! I don’t know how you managed to sleep on the megabus. Although the journey is almost entirely motorways, which means there aren’t many bends, there is still a lot of movement. On the way up I was on the top bunk right next to the articulation point, which seems to get a lot of yaw (nodding-axis) movement. This wasn’t too bad, and I managed to get a few hours sleep. On the way back down however, I was right at the back of the trailer section, again on the top bunk. Even if you’re travelling in a straight line on a motorway, the vehicle will still wobble side-to-side in the lane a bit, and a trailer will sway side to side constantly. If you’re lying on your back this isn’t so bad, but if you try and sleep on your side, you will be pushed onto your front or back constantly. Imagine you’re asleep on your side and the house is on fire, and someone bursts into your room to try and wake you up by frantically shaking you. That’s what it’s like, for 8 hours. On the way up the crew assured me that the ventilation was on, but the heat was stifling. It was a very sweaty journey. On the way back down however, it was nice and cool, as a bedroom should be. This suggests that the fleet aren’t very well maintained; I’m sure the ventilation on the outward journey was broken. Also on the way back down, the bus broke down before it had even left the bus station; it took two trips for an engineer to megabus’s depot to grab two different battery boosters (the first wasn’t working) and we were eventually on the road. But it’s quite staggering that I could have flown for two to three times the price: that’s not really that much more of a budget considering those airlines somehow manage to keep their fleet of planes from dropping out of the sky, and megabus seem pretty slack at even keeping their buses on the road. While waiting, some fellow passengers said the same fault had happened on the way up. I respect megabus for innovating and I really like the idea of a sleeper bus service; it seems like a fantastic way to save time; in principle, if you’re asleep, you won’t even notice the journey, and no time will have been wasted. The reality however is quite different. I spent most of my first day in Glasgow catching up on sleep in my hotel. That was a waste of a day. Another factor that I had anticipated but not quite appreciated while booking (although this is not megabus’s fault by any means; just something you might want to consider), was that most hotels do not check-in until midday. My hotel didn’t let me in until 14:00; so that was 6 hours of milling about. Despite having brushed my teeth at the coach station and dropped my bags off at left luggage, I still didn’t really feel like sight seeing; I was too knackered. Add £5-10 for the luggage locker, £5-10/hour in coffee shops, £10 to see a film I didn’t really want to see, milling about for 6 hours isn’t such a cheap option. If I’d actually managed to sleep on the bus I might have been more imaginative, but it’s difficult to sleep when the bus is shaking you like a British nanny. In summary, this is a good option if you are very strapped for cash. It’s certainly better than the hellish night (or even day) coach trips where you are crammed into a narrow seat the whole way. However, my sister joined me in Glasgow the following day and gloated that her train journey actually cost *less* than my megabus ticket because she’d booked so far in advance! Next time, I’m definitely going to fly, get the train, or maybe even drive. Amazingly, the train only takes 4h 30m. And if you have a laptop or a book, that’s not necessarily wasted time. n’t – it’s a scam. I’ll never do the train to Glazgy again. The single biggest issue for me, which should be easy to fix, is the temperature. There was an air-vent blowing hot air all night near the articulation point where my berths were, meaning that even without the duvets it was too hot all night. From the other reviews, and other customers, it seems other parts of the bus are less affected by this. In a bus full of engine and 28 people, all giving off heat, and all wrapped in thick duvets, I can’t really imagine ever needing heating, though cooling might sometimes be needed! I used the megabus gold last night from Glasgow to London. The staff where incredibly attentive and friendly. The complementary drink and snack at the start and end of the journey were appreciated. I think it’s a great idea and they do all they can to help you sleep eg black out curtains. However, I am not sure I would use this again as I discovered i was claustrophobic, air was stifling and you can’t sit up in the bunk. There is not a lot of space so the easiest way to get in and out of the top bunk is crawling on your hands and knees. When I calmed myself down I did manage some sleep. Good to hear you found the staff friendly. I agree it’s a bit claustrophobic!